Several years ago I attempted to build a coil gun, but gave up in frustration after burning out several SCR's when designing the trigger circuit. The SCR is used as the switch that dumps the energy stored in the capacitor into the coil. I've since brushed up on my fundamentals and tackled the problem once more. Below is the circuit I've come up with. 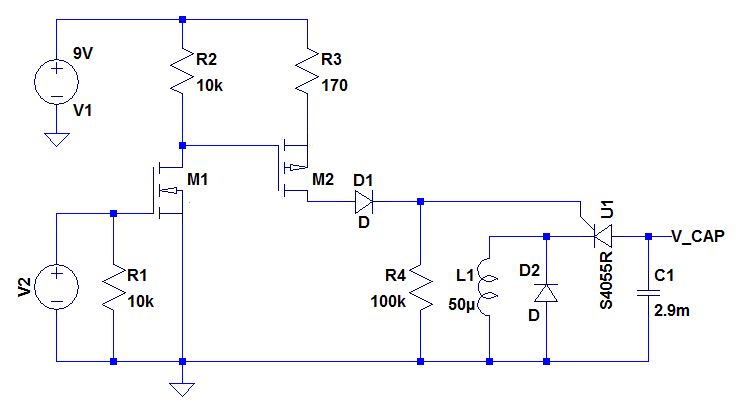 R3 is a current limiting resistor used to limit the gate drive current to 40mA, which is the rated maximum gate current required to turn on the SCR. 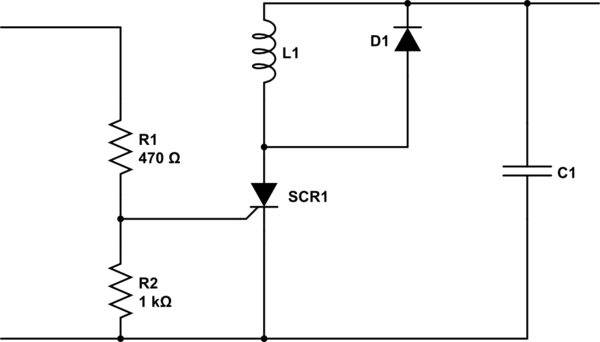 R4 is used as a pull-down resistor to prevent spurious signals from triggering the gate of the SCR. Since C1 is charged to 200V, I've included D1 to prevent the drain of M2 from seeing large voltages when the SCR is triggered. L1 is the coil and D2 is used as a flyback diode to prevent reverse charging of C1. I know I've left out some details, but is the overall design of this circuit good practices? The major problem appears to be that your SCR Cathode will start to rise as the device turns on and critically reduce the gate drive. You certainly won't meet the minimum t(gt) of 2 uS and may find the SCR turns on very slowly. You should move the SCR to the ground side of the inductor. I haven't scrutinized your triggering circuit and won't dwell on it as it may be somewhat secondary to your SCR burn out problem (the trigger circuit does seem unintuitive). You have not indicated the nature of and how the capacitor charging source V_CAP is connected. If V_CAP is a DC source with no zero crossings and remains connected to the capacitor when the SCR is fired, the SCR will remain in conduction once triggered, ultimately allowing a steady DC current to flow through the SCR and coil and likely destroying the SCR (essentially a short of the SCR). If V_CAP is isolated from the capacitor prior to triggering the SCR, then you should not suffer from SCR burnout (assuming that withstand voltages are respected). As pointed out, the cathode of the SCR should be connected to ground potential. You can do this as suggested or you could arrange the circuit similar to a flash lamp circuit with the capacitor in series with the coil and V_CAP. The capacitor charging current path would be through the coil. At the point the capacitor is charged, V_CAP would be isolated from the capacitor and the + terminal of the capacitor would be connected to ground through a switch or SCR dumping the charged current into the coil. If V_CAP happens to be the unfiltered rectified output of something like an inverter circuit, the rectified waveform may eliminate the need to isolate the SCR to allow it to shut off and the capacitor to resume charging. A resistor in series between V_CAP and the capacitor may be desirable to limit charging current to something reasonable. I also don't think you need the recirculating diode D1. If the SCR was instead a power MOSFET and you were using the MOSFET to switch off the coil current, then you might need the recirculating diode. A typo on my part. I meant D2, not D1. In the case with no D2 and assuming no resistance in the inductor - capacitor circuit. The initial voltage on the cap is V_cap. At the moment the SCR is triggered into conduction, the voltage across the inductor matches the capacitor (assume an ideal diode) and the current starts to increase in the inductor following a sinusoidal form with the characteristic frequency W = (1/LC)^0.5. The current lags the voltage by 90 degrees and reaches a peak magnitude just as the voltage across the inductor and capacitor go to 0 volts. Current continues to flow but starts to reduce as the voltage across the inductor and capacitor increases in reverse polarity. The current passes through 0 at the point that the voltage on the capacitor and inductor has reached its maximum negative value of -V_cap. Once the current passes through 0 the SCR ceases to conduct because it will be reverse biased. When the capacitor voltage hits -V_cap, current in the SCR is zero, the SCR ceases conduction and the SCR is reverse biased and will not go into conduction if the gate is triggered again. If you were to then reconnect the capacitor to the V_cap source the capacitor would effectively have a voltage of 2 x V_cap applied to it and it would indeed go Kaboom. With the addition of the diode D2, as soon as voltage across the capacitor / inductor starts to go negative, D2 should go into conduction shorting out the capacitor / inductor and preventing charge from building up on the capacitor in the reverse direction. This should prevent the capacitor kaboom problem. However, you are requiring the diode to dissipate all of the stored energy in the circuit which, depending on the capacitors initial voltage, may be significant. I might be inclined to use a power resistor as a dampening circuit; but, that will depend on the operating frequency of the device and how much energy you have stored in the capacitor. The other thing to consider is that if this nail coil is actually 'doing anything', there will be an effective load resistance in parallel (or series depending on how you model it) with the inductor. If the load is large (parallel resistance is low), the circuit may become over damped in which case the current in the inductor will reach a peak and then may decay exhibiting no oscillation. Not the answer you're looking for? Browse other questions tagged mosfet scr or ask your own question. Will this phototransistor circuit work?